Sign up for our newsletter which comes out about once a month. We won't use your e-mail address for anything else, promise. 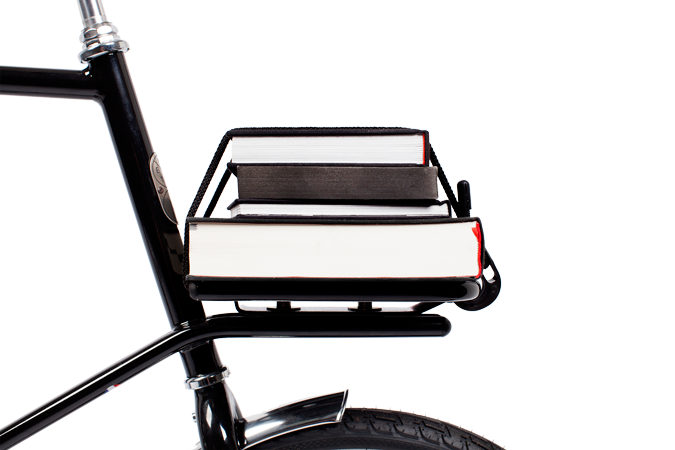 We proudly introduce Minute, the mini commuter that lasts a lifetime. Born out of love for cycling and the result of a quest for the ultimate city ride. The original Minute is now available in beautiful polished black, with an optional classic black leather Brooks B17 saddle. We are dedicated to make the best urban commuter on the market, and that's why we are constantly experimenting with new ideas. And we'd love to hear yours! A smaller size wheel is stronger, lighter, more agile and at least as fast as a large wheel. And something you will really appreciate when you have to take your bike to your third-floor apartment. To reassure you - and it might come as a surprise - several world records were broken on bicycles with remarkably small wheels. We believe in the future they will become the norm rather than the exception. And until that day comes, enjoy being a frontrunner. Minute is made from steel. A strong, comfortable and durable solution for your city ride. The well-thought-out construction is the result of a careful engineering process. The frame is a fraction smaller than a regular bike and a perfect balance of strength and low weight. Minute is designed in Holland and built in Belgium. Two small countries, big in riding bikes. We are dedicated to make the best urban commuter on the market, and that's why we need your help. This spring, the first Minutes are driving around in cities across the globe. We are eager to hear about your experience and what you want us to dive into next. We are currently setting up a platform for sharing your ideas about the evolution of Minute. Stay tuned!